Josef K has just turned 30. He is a senior bank clerk. He is arrested by two unidentified agents for an unidentified crime.The arresting agents, however, do not take K away. Instead, K is told to await instructions from the Committee of Affairs. The story follows K over the course of the year after he is arrested as he struggles against the Law and the Court to resolve the charges made against him. All the while, he maintains his innocence. Ultimately the burden on K is too much and the result of his inability to resolve the charge is self-destruction. Pressures stem from K’s dealings with the accusing “system,” the lawyers necessary to participate in the system, the social conditions surrounding the effect of the arrest on his employment, and the obvious effects on other accused seeking to prove their own innocence. Perhaps the only worthwhile advice comes to K from a chaplain associated with the court. The priest provides the advice in the form of a Parable known as “The Parable of the Doorkeeper of the Law” or “Before the Law.” The meaning of the parable is somewhat ambiguous to K and pages are devoted to its explanation in the form of a conversation between the priest and K. The parable and explanation signals K’s fate. Kafka worked as a bureaucratic employee for several years and wrote to stay sane. It was his passion. He passed away leaving a instructions to his executor to destroy his writing without it being published. 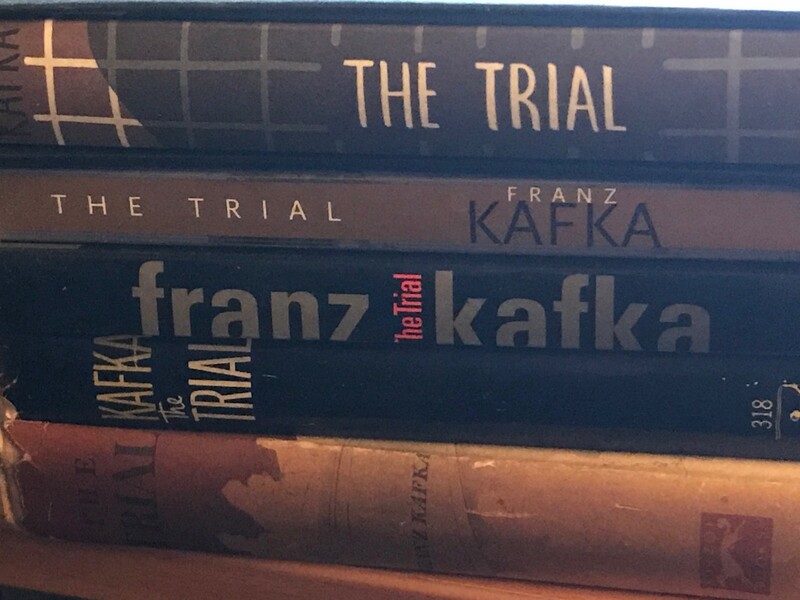 Fortunately, his executor, Max Brod loved Kafka enough to ignore his request and his writings were published posthumously. Kafka’s writing accurately captures the feel of a worker trapped in bureaucratic servitude. In the mind of a bureaucrat, appearances are more important than explanations. Accusations that threaten to ruin lives are looked at frivolously by everyone except the accused. The horror of K’s story in The Trial is he can never quite come to understand what he has done wrong and why it is everyone assumes he will eventually be found guilty. K devotes hours of his time and energy to show his innocence or to at least find someone to take his case as seriously as he does. At every turn he is told presenting his case is a formality that will ultimately have no effect on the predetermined outcome, guilt. Everyone suggests he simply avoid a resolution as long as he possibly can and in making that suggestion presume he will ultimately be unsuccessful in proving his innocence. K refuses to accept his fate. I won’t reproduce the parable in its entirety, but it can be found in The Trial. It was also published separately in The Germanic Review, May, 1964. Within the parable is the very question of the meaning of life. I encourage you to read it and study it for yourself. It is this parable that makes The Trial my favorite novel. The parable illustrates a certain hopelessness present throughout the novel. K does not know what he must do to be free. He hopes he can be free and prove his innocence but there is no indication aside from his own optimism this will happen. In literary tradition, parables are meant to illustrate a point or teach a particular lesson. The parable conveys the entire meaning of the story. It tells us K, like the man in the parable, will struggle toward something for the rest of his life, but the thing he is struggling for is out of his grasp. The struggle K has been involved in has consumed his life to the same degree the man in the parable was consumed and as a result what life he had left was lost. Kafka is a master of creating the futile scenario. K’s attempts to prove his innocence are futile. K’s heroes, though, always persist in their struggle. They are always just a touch too stubborn or come at the problem from just the wrong perspective. In this way they can not fully experience how futile their efforts are. As the reader, though, we can look down on them and see their futility. Our life may be every bit as futile as K’s, though. This is Kafka’s brilliance. Kafka uses the parable to show the reader even though K can see the futility of sitting before the doorkeeper of the law, he does not recognize his own existential futility. Even if K did recognize the futility, though, and even if we recognize the futility of the menial tasks we engage in every day, would we act any differently? Our instinct is still to live even if existence is futile and we recognize it. We shouldn’t focus on the futility, but instead should live according to our instincts. In this way we can exist without being consumed by our inevitable fate.